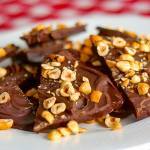 Cappuccino Hazelnut Chocolate Brittle - incredibly delicious homemade candy brittle that makes an ideal wedding favour or to use for Holiday gift giving. Roast hazelnuts in a shallow pan for about 10 minutes at 350 degrees F. Roll the roasted hazelnuts in a tea towel to remove the skins. Rough chop the nuts with a large knife. In a medium saucepan over medium low heat combine white sugar, brown sugar and corn syrup. Dissolve espresso powder in hot water and add to sugars. Bring to a rolling boil and add butter. Cook low and slow at a very gentle boil to 300 degrees on a candy thermometer without stirring. Remove from heat and stir in salt and vanilla. Pour mixture onto a greased cookie sheet and spread out to ¼ inch thickness. When the brittle solidifies but is still hot, sprinkle the chocolate chips over the top and let stand for 5 minutes to melt. Spread the melted chocolate chips evenly over the surface of the brittle. Sprinkle the roasted chopped hazelnuts over the top pressing them into the chocolate. Allow to cool thoroughly before breaking into pieces. Store in an airtight container.